The otitis is an infection of the ear that can affect both children and adults. A cold evil cured, for example, may be the origin of an otitis. Although more common in winter with the arrival of cold (which is called medium or winter otitis), also in summer we are exposed to infection of the ear canal (otitis externa) mainly due to contamination with the water of the swimming pools. To prepare its appearance when lower the temperatures, in addition to wrapping up the ear well, we must maintain proper nasal hygiene and avoid colds. Let’s see, then, what are the main causes of otitis, its more common symptoms and, of course, the most appropriate treatment. Otitis is an infection caused by germs that enter the body through mouth and nose, through the larynx and reaching the middle of the ear through the eustachian tube. The most common symptom of otitis is the pain, which can vary in intensity. In the case of children, otitis can cause nausea, vomiting, nervousness, nocturnal awakening and even rejection of the bottle. In adults, meanwhile, the most common symptoms are headache, sensation of plugged ears, tinnitus, dizziness and hearing loss. The fever is more common in the case of children. When many pus and mucus accumulates in the inner ear can cause a ruptured eardrum to eject. It should not be alarmed, because it actually relieves pain and the eardrum will close again in a few days. Some otitis cured spontaneously, but in other cases may require medication and should be prescribed by the doctor. To soothe the pain you can take a painkiller like an acetaminophen or prescribe some ear drops that soothe the pain and reduce inflammation. The antibiotics will only be useful when it bacterial otitis. If it is viral, will not be effective. Younger children and allergy sufferers are more prone to ear infections, so if the episodes are recurrent doctor may prescribe a preventive antibiotic treatment to clean the ear canal. 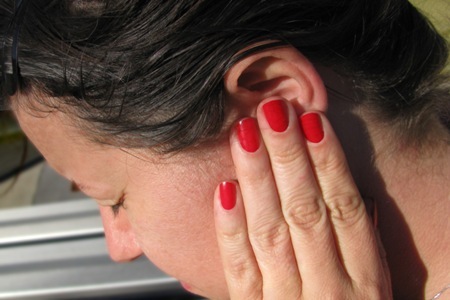 Among the home remedies to relieve ear pain caused by otitis we can apply heat, simple and safe remedy. Heat a cushion stuffed seeds (available at health food stores) in the microwave and place it on the affected ear. Another alternative is ironing a towel mittens and fill it with coarse salt.